Day 1: Our first day finally arrived and Joe and Jake dropped us off at the airport at 11:45 for our 1:45 flight. That was none to early as their was a whole group of French students returning home in the backage check line ahead of us and it then in security ahead of us and we just got to our gate as the plane was boarding. Wow--15 hours later we are in Riga. The 9 hour flight from Chicago to Warsaw, Poland was rough. The seats were small, the movie was dubbed over in Polish, and it was the middle of the night. We both went a little stir crazy. I kept thinking that some of you 4th graders in my class would struggle on this flight. We arrived in Poland 45 minutes late and only had 30 mn to go through immigration where they stamped our passport with the Polish stamp, we went through security again and had to find our new gate when none of the signs were in English. Overall, most of the people in the travel industry speak English so if you can find someone to help you, they can understand you. We "ran" to the gate and got there just in time, they were holding the plane for us. We walked down loading dock steps, to a shuttle van and out into the middle of the runway where a little plane that had propellers was waiting. This plane did not hold many people and was seriously small. All in all we spend 13 hours flying. When we arrived in Riga we did not go through customes/immigration and they just let us walk through. The bad part is now I don't have a Latvia stamp in my passport. We grabbed our suitcases and there was a driver there holding up a sign for us letting us know he was who was picking us up. He dilivered us right to the front door or our apartment building. Waiting for us there was a sweet girl who walked us through the apartment, took our money, and gave us the key. We settled in. It is very nice. We walked across the street to a gas station and bought water (you need it for drinking, brushing your teeth, and cooking--I already used it to make soup) and what they call "light Coke". The gas station looked just like a Freedom only really neat and clean and shiny new. Also, the candy isle had all American candy like Twix, Kit Kat etc. The pop is Sprite, Coke products etc. They have their own brands of juices. We bought a can of Pringles. Who knew we could buy Pringles in Latvia. We are now going to bed as we get picked up for court tomorrow at 8:30 a.m. After that we will hopefully have Vlad with us and he can help us go on a site seeing adventure. Day 4: Happy Birthday Jake! The kids in my class seem especially interested in the food we are eating so today I took some pictures of food. The first picture is of a Latte that I ordered at Double Coffee, a little cafe where we had lunch. Isn't it beautiful?! It tastes about half as good as it looks but it looks good!! There is a dark chocolate syrup layer on the bottom, then milk chocolate, then coffee, then cream/foam. It was a treat. For dinner we ate at the Lido which is a huge family entertainment center with outdoor skating (inline in the summer), an amusement park in the summer, decks and screen porches, a huge buffet restaurant with a polka band bar on the bottom floor. The eating building was a log cabin. The servers wore traditional Latvian clothes and flower head pieces and all. Quite the place. Anyway, I had a chicken roll that was interesting. It was a thinly cut chicken breast wrapped around cheese and then breaded. It was pretty good. For desert John had the pretty glass of chocolate cream squares floating in sweet creamy sauce. The chocolate cream was not runny like pudding but firm and spongey, not cold like ice cream but having an ice cream like consistency. It was yummy. His favorite thinkg so far. It's no wonder as it involved chocolate. A couple things we've noticed about the food. First, it may look the same but it never tastes like what you are used to. It's not that it tastes bad, it's just different. Second, things don't have as much buttery taste and when things are greasy they are oily, not buttery. The fries are a perfect example. Third, the chocolate is often not sweet, more bitter and dark and if it is sweet then it is more sweet than chocolate. Hmmm...Finally, and this is the one we are sick of, all drinks seem to be served at room temperature with no offer of ice or anything to make it cold. Coke light, right off the cupboard, bottled water, right off the shelf. We want COLD! 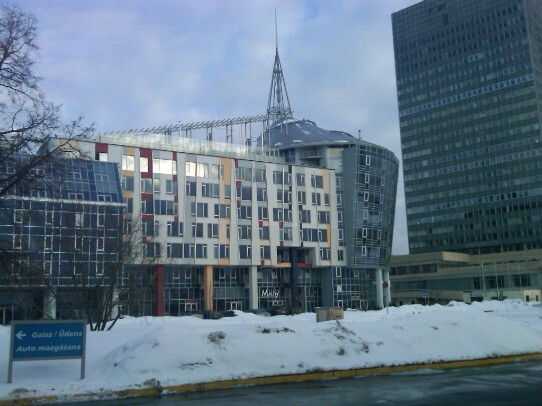 This is the building where our apartment is. We are on the second floor and have 2 bedrooms, a small camper/Ikea style kitchen, a bathroom and living/ining room. It is very clean and nice. There is a way cool bridge I'll take a picture of tomorrow as well as some cool old buildings from Old Riga. Our apartment has only inner courtyard windows so you can't see it here. Good night. DAY 2: Here is a picture of Vlad on his bed in the room he shared with 2 other boys and then a picture of him with two staff people from the orphanage who said they will miss him and that he is a good boy. 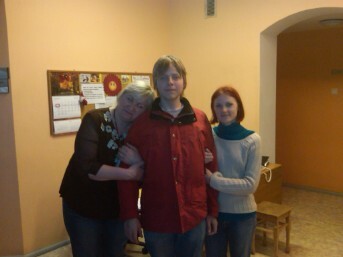 Our day started with being picked up by the Latvian attorney, Daina, and her husband Edgars. They ae both very nice. They took us to the orphan court where we had a 9:15 hearing. But the woman from the orphange was late--an hour late. It is the blonde woman in the picture and she felt terrible. And she didn't have Vlad with her. Sad. The hearing involved our attorney and us with a translator, a judge, her 2 staff people, the orphanage woman and a social worker. John was the only male in the room. We were asked if we thought Vlad wanted to live with us and I told them that he was the one who asked us if he could come to America and be Vlad Kovacs. They all laughed. They asked what our other kids thought as we said they too wanted Vlad to come. They asked why we thought a 1 week bonding period was enough and I said because he'd been in our home already for 18 weeks over the course of the last 2 years. They asked if we would make arrangements to stay longer if they thought it was necessary and I said, of course we would if we had to but we hoped that wouldn't be necessary. They asked us to leave the room while they discussed, read documents and made a decision. We waited in the hall. About 10 minutes later they called us back and the decsion was that we could have Vlad with us from today until March 15 which is when we have a second appointment at their court. We left and Daina dropped us off at our apartment telling us she'd pick us up at 3:00 or so to go get Vlad. We made soup, napped, and then waited. She came about 4:00. Traffic was awful and we spent an hour in the car to go 15 miles. We parked in the road and as we walked up the side walk the door came open and out walked a smiling, sparkling Vlad saying, "You are here, I go to America. I ready to go." We hugged him and he showed us his room, which was cute. The halls and floors were in bad shape and the doors were not good but the section he lived in was painted fun young kid colors and all the kids looked happy and were asking Vlad if this was his family. He proudly said, "Yes, family." We looked over paperwork of Vlad's history and signed some promises to take care of him and call the orphange if he tried to run away etc. and then we were on our way. Vlad's orphanage was in a beautiful part of Riga and sat next to several beautiful mansions. The trip back to our apt. included a tour of where we should walk tomorrow to get Vlad's visa pictures taken, grocery shop, eat, buy coffee, and tour Old Riga. We are looking forward to a fun day with Vlad tomorrow. Wednesday the social worker and Daina visit at 10:00 a.m.
Will write more after our adventers tomorrow. What's important to note about today is that "We've got the package!" DAY 3: Today we toured Old Riga with Vlad. It was so cool. It looked very much like a movie set or a toy city. The buildings were big, old, and full of amazing architectural detail. Just look at these pictures. We were way more impressed with Old Riga than Vlad was. To him it was just the same old, same old. We started our day by getting our internet connection fixed. A girl from the stayinriga place we are renting this apartment came and it only took her a minute to have it up and running. Thank goodness. Now both John and Vlad are entertained full time. After a quick breakfast of oatmeal and cereal bars from home, we started our walking tour. One short block away is an amazing street called Elizabates Street that we took for several blocks. It is full of cool old buildings. We also saw the World Trade Center of Riga which used to be a communist government building 20 years ago when Latvia was still under Russian rule. Our first stop was a Kodak shop where Vlad had his picture taken for his visitor visa and embassy paperwork. Then we crossed the street to a coffee shop and decided to have our first Latvian restaurant experience. It was good. Vlad had what looked like a club sandwich. John had a grilled chicken sandwich and they both had peach ice cream malt like drinks and fries. You only got a handful of fries, less than a McDonalds small fry for sure. But they were good. Sort of soft and chewy though. I had an interesting sandwich that had ham, cheese, tomatoes all together in a roll up kind of thing that looked like it was going to be like the outside of an eggroll but was actually soft like a crepe or thin pancake. It was rich but good. We all shared so everyone could taste all things. Then we walked to Old Riga. Check out our pictures--it is amazing. We can't wait to come back this summer as Daina, our attorney in Latvia, says that all the cafe's have out door tables and flowers and that it's like being in Paris or Italy. How cool is that? The streets are all cobblestone and people are walking on them but every now and then a car rushes by. That brings up another thing we noticed. Pedestrians definitely do NOT have the right of way. More than once we saw people run out of the way of cars as the cars were not slowing down or worrying at all about the walkers. The cars get parked up over the curb on the sidewalk making walking challenging. Weird. Also, cars are parked facing all different directions on one side of the street. Yikes! Interesting fact we discovered at the orphange...Vlad had headphones in his ears in October and was walking on the street and was hit by a car. No worries according to him as he popped right back up and only limped for a while. I'll kill him if he dies after we've spent all this effort to get him. We spent about an hour at a bank making an exchange of money. We still had our money strapped around our waists as the attorney wanted Euros and we need Lats to spend. So we went to a bank in Old Riga--near the McDonalds. We took a number and sat down. They had flat screen tvs telling what number they were serving and at what teller. We finally got up there and said what we needed. The teller took our 100 bills and looked at each one carefully. Now remember, I had ordered new bills from the bank and they were crisp and pure--or so I thought. She found about 20 of them to be "marked" as they had a little blue stamp on the back. She charged us and extra 41 dollars of Amerian money to exchange those bills. I wanted to say that maybe more Americans would come to Latvia as tourists if they weren't so fussy about our money. John was nervous walking back to our apartment as many people saw her hand us money and saw us strap it in our waist belts. No worries. After that we returned to the grocery store that was near our lunch spot and bought some fruit, paper towels, milk, juice and more water. On the way back through the park Vlad and John bought me some red tulips and they are on our table now. Tonight I cooked the pasta, fettuccini from home and added chicken from the deli at the grocery store. We had oranges and bread and chocolate for desert. We are tired from the walking (probably over 2 miles) and all the fresh air. It was about 34 degrees and sunny--beautiful day to be outside. Snow was sliding off metal roofs everywhere and crashing into cars and people. Look out! Tomorrow we have the social worker and our attorney coming here at 10 a.m. You'll all be asleep. John just said it will take people longer to read about our day than it was for us to live it so...I'll say good-bye. More on Day 4: Readers beware: I am no longer detered by John as many of you have said I should write as much as I want. We started our day waiting for the social worker and our attorney to come and do a post placement interview. They were to come at 10:00 but got held up by court and didn't get here until about 11:00. We all sat around in the living room and they talked a lot to Vlad. He is so charming and talkative and confident in his conversations with adults. We have noticed it before but it continues to stand out as a strong trait in his character. I guess it comes from having to fend for yourself and be your own advocate. He had them laughing all the time. He is a funny one, that boy. The social worker asked if he wanted to be part of our family. I had a picture book out and she and Vlad went through the pictures her asking who everybody was and him explaining, "brother Joe, brother Jake, Jamie's brother Scott, cousins Scottie, Hadley..." and so on. She stopped him and asked if he didn't call us mom and dad. We said he calls us John and Jamie. It is fine with us, he can call us whatever he wants (well, you know what I mean) but she seemed like it bugged her. I then told her when he talks to others about us he says mom and dad as a way to explain who we are and then she seemed fine. He told about his room and how he keeps it neater than his brothers keep their rooms (the truth hurts boys) and all about the dogs, the cousins, the lakes, the hockey, the golf, and more. The social worker said, "He looks very happy to be part of this family." Then she asked us if we were sure we still wanted to proceed and we said yes, we love Vlad. At this point the social worker took Vlad to the table where he had to write a statement saying he consents to this adoption and why and then sign it. While this was going on Daina looked through Vlad's medical history and told us, "Oh my, it looks like he had tuberculosis in 2002." Because of the TB he needs x-rays on trip 3. "Also, he was diagnosed as developmentally delayed." I said I'd heard that before but believed he was smart, not delayed. She then said that the red head from the pictures of the first day just recently took Vlad to a doctor again and had that diagnosis overturned because she too agrees that he is smart. Daina explained that often when these kids come into the system they are coming from iffy homes where they missed a lot of school and weren't taught anything so they are often wrongly labled developmentally delayed. Anyway, the doctor agreed that based on his current schooling and his answers to the questions asked Vlad is NOT developmentally delayed and so that diagnosis is going to be overturned and that statement put in his record. The attorney wouldn't take our payment yet (she didn't want to do it in front of the social worker) and so we are still walking around with most of our money. YIKES!! We had really hoped to be rid of it by now. After they left John and I napped (we keep waking up at 4:00 am unable to go back to sleep) and waited to call Jake. With the birthday call to Jake under out belt we headed out for a trip to Vlad's school. We started walking, having no idea where we were going. We returned to Old Riga on the same path we'd taken yesterday. Vlad assured us that was the right way. How could that be? He hadn't said a word about it yesterday even though many times we aksed where his school was from here. He communicates like a 14 year old. After we walked further than we walked yesterday we were stopped on a corner waiting for the light when a bus pulled up and Vlad jumped in. "Get in, get in" he yelled to us. Unbelievable. No warning, no tickets, no idea how to pay but if we wanted to stay with Vlad we needed to get in. We jumped in. Vlad took our money and bought us tickets from the bus driver and we were off. We still had no idea if the kid knew what he was doing but, to save you the suspense, let me just tell you, he did. Turns out my suspicions yesteray were right and Old Riga is yuppie-ville full of restoration dollars as well as history. Well we weren't in Old Riga anymore. The buildings were now old and full of history minus the restoration dollars. We clutched at our money belts and John mentioned more than once that he wanted to turn back. After a couple miles Vlad stood up and said, "Get up, get up." The bus was still racing down the street but apparently you need to be at the door the second it stops. It was what everyone did. Again we marveled at how unsafe these people seem to be. We jumped/flew off and found ourselves once again on a cobblestone street with cars zooming right by. More than once I pulled Vlad back out of the road. He said, "Jamie, for 14 years I crossed the road. I know what I'm doing." I reminded him that he had been hit by a car in October and that I've been crossing roads for nearly 50 years and I've NEVER been hit by a car. We discovered that the way pedestrians cross the street is to step out and lean and wait for a few cars to go by before giving up and just dashing across. Vlad's school was in better shape than the orphanage and we could see why he liked to be there all week. He had called his 2 best friends and while on the phone with them asked if we could take them to the Lido for skating and dinner. We said sure. 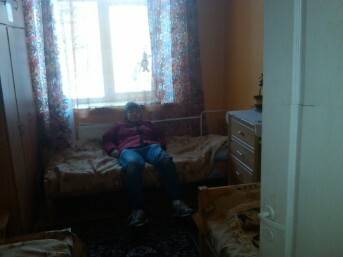 We went to Vlad's room on the third floor where he gathered his 2 back-packs and some clothes and school things he had. Amongst his things were the photos I'd been praying he would have--little Vlad. He thinks the pictures go back to when he was in third grade but I think he's younger then that in some. When I saw them I started to cry and just wished I could have a day with that little boy. He was so darling and cute. He had that shiny white hair and the same rascally smirk and I just wanted to hug him. He said that at the time of the pictures he was already in orphange care. I asked him why he didn't come live with me sooner and he said, as only Vlad can say, "Jamie. I don't know you then." Oh how I wish he had. The friends were shy and polite and Vlad was in heavan showing off what a great of a skater he is (thanks Joe for teaching him to turn and skate backwards--everytime I went to take his picture skating he would turn and go backwards so I have lots of pictures of his back). The Lido was like an entertainment center--think Taylors Falls ski challet. It was old and goofy but lots of people were having fun. It might be beautiful in the summer. When skating was over Vlad lead the pack to the restaurant which was a buffet. We made great salads at the salad bar with creamy cucumber dressing. It was great to eat a salad. The boys filled up their trays, Vlad took 2 entrees (still showing off I think) John grabbed a room temperature strawberry malt and we checked out. Vlad had to know how much we spent and seemed to want to brag about it to his friends. I'm sure it was fun for him to be able to take friends out on the town. He was so proud to be showing his friends a good time. A couple times today Vlad did some things that showed us he was being protective of us. He walked me to the bathroom as he was afraid I'd go in the wrong one, he pushed us on and told us to stop talking to people because they just want to beg money off us, and he warned us that diner would be expensive, are we sure we want to take his friends. So sweet. Yesteray I was talking to a lady as we walked through the park and she wanted money. Vlad was telling John, get Jamie away, she just wants money. I gave her a couple lats (4 dollars US money) and he shook his head. "Jamie, let me tell you secret. People in Riga bad. Drink, don't work, ask you for money." I told him there are people like that everywhere, Riga's not alone. We got back on the bus and the friends got off at their stop and we got off about 15 minutes later just blocks from our apartment. Tomorrow we may try to find the Zoo. We are trying to arrange a meeting with the Artrus x 2 (friends of the Vlad in Colorado) so we can take them bowling or to the zoo and then to eat. Sorry I'm so long winded, it's just a lot happened today. In case I need to point Vlad out to you, he's the blonde wearing the bright blue and tanish grey hooded sweatshirt looking straight into the camera. 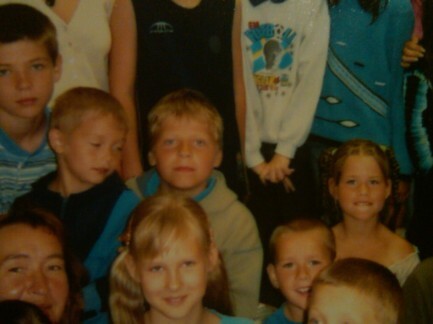 He's in the second row, the 2nd boy in, kind of in the middle of the picture. Could he be any cuter? He looks a lot like Jake looked when he was this age. Oh how I wish I could give that little boy a hug. We are trying to figure out his age--maybe 6 or 7?